Are you interested in becoming Catholic, whether through adult baptism, returning the Church, or being Confirmed? Our pastor, Fr Meyer, hosts an engaging class exploring the beauty and tradition of the Catholic faith on Tuesday nights at 7 pm, starting September 4th in the Fireside Room at the Newman Center. Click here for a full schedule and details. Bible studies are a great way to grow in relationship with Christ and each other, learn more about the faith and form authentic friendships. There are over 40 Bible studies on campus almost every night of the week, with around 110 students attending regularly. Connect with a FOCUS missionary or student leader to get involved in a Bible study. 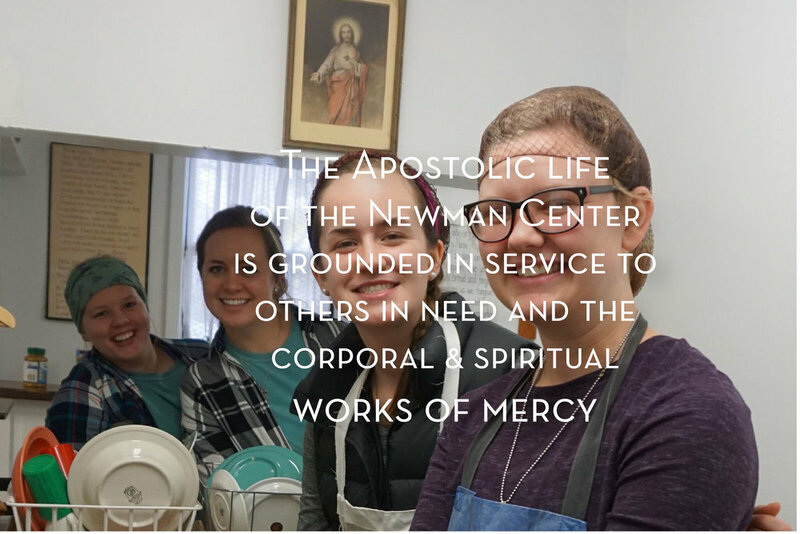 Students at the Newman Center have many opportunities for retreats and trips throughout the year, such as the annual Father's House Retreat, Spiritual Bootcamp, & multiple domestic and international mission trips. UND Catholic often offers opportunities for community & recreation through camping & ski trips, and other student-led adventures. There are endless opportunities to check out UND Catholic and the Newman Center. Come in for a casual "Fireside Chat" every other Thursday, where a current issue is broken open & discussed, monthly worship nights in the Chapel, dances, women's nights at the Newman House, and social events planned by the Student Board. Click here to view our upcoming events. Our active college council of the Knights of Columbus makes an impact on and off campus through a brotherhood of faith and service to causes big and small. Joining a local council of the Knights puts you in touch with an impressive national organization. Look for the Knights during the annual BBQ after Sunday Mass on Welcome Weekend. The Fellowship of Catholic University Students is a national outreach organization that meets college students where they are and invites them into a growing relationship with Jesus Christ and the Catholic faith. Join dozens of UND Students for SEEK2019. Donors who commit to a monthly gift of at least $20 may enroll in UND Catholic's mug club. Members of mug club choose from a selection of UND Catholic branded mugs, blender bottles, and stainless steel tumblers. Saturday May 4th, join us for our annual end of year banquet at the Goreki Alumni Center. Students, supporters, and friends go head to head (or handlebar-to-handlebar) with BisonCatholic as points are earned for fundraising, sponsorship, and a 27-mile bike race halfway between the our universities in Hillsboro, ND. Mark your calendars for April 27th!